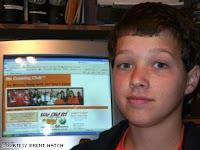 McKay Hatch was an eighth grader when he started a “No Cussing Club” at his school. Today, the No Cussing Club has 20,000 members in all 50 states and 30 different countries around the world. Hatch has been interviewed on TV by Jay Leno, Dr. Phil, Ryan Seacrest and many more. He has also had death threats, had his web site hacked and his address posted online, and someone even sent prostitutes to his house. But McKay refuses to be intimidated away from doing the right thing. 5 The tongue is a small part of the body, but it makes great boasts. Consider what a great forest is set on fire by a small spark. 6 The tongue also is a fire, a world of evil among the parts of the body. It corrupts the whole person, sets the whole course of his life on fire, and is itself set on fire by hell. 7 All kinds of animals, birds, reptiles and creatures of the sea are being tamed and have been tamed by man, 8 but no man can tame the tongue. It is a restless evil, full of deadly poison. The amazing part of the story of “No Cussing Club” story is how it started with one middle school student and has spread all over the world. When we do the right thing, it has an impact on others. Sometimes that impact can be seen. More often, the impact is in small and hidden ways that later “raise a harvest of righteousness” (James 3:18).